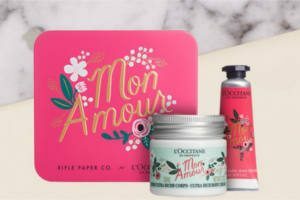 Get a FREE L’Occitane Mon Amour Beauty Gift Box at L’Occitane boutiques. No purchase necessary in store. Print or show this offer on your mobile device at your nearest at L’Occitane store to redeem. Free Gift Offer valid only until February 14, 2019, or while supplies last. Free Gift Offer is only valid in the US. May be redeemed at L’OCCITANE Boutiques with no purchase required or Online with any purchase.